Fire up those cybernetic implants for some quality time with Spyborgs straight from the PAX showfloor. Spyborgs looks like a quality Saturday morning cartoon (before they killed all of the good ones off,) with a great set of humor, webisodes, and comic books to support the antics held within. 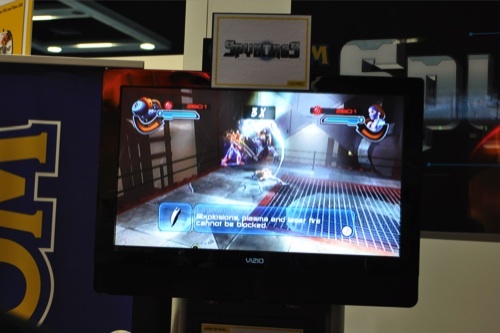 The game covers 3 Spyborgs, or cybernetic spies; a hulking robot named "Bouncer," to the female ninja named "Clandestine," and a Bionic Commando nod named "Stinger." Follow these three on their co-op brawler adventure in Spyborgs. When I first picked up Spyborgs, I played with an awesome kid on the PAX show floor. He picked Clandestine, while I was playing as Bouncer. As we were running around on what appeared to be a cyborg pirate ship, I noticed our powers combined if we were both finishing off the enemies at the same time - this gave us a very cool looking co-op "Finishing attacks." The characters moved fluidly around the screen, I didn't notice any issues moving around objects even with Brawler being 3x the size of Clandestine. The controls were relatively simple to pick up, move with the nunchuck analog stick, attack with B and C, jump with A, and block with Z. When you're prompted near your co-op buddy, you give the Wii-remote a little waggle to deliver that awesome co-op finishing attack, filling up the screen with Spyborg destruction. There were items, obstacles, and loads of things to break on the ship (including your enemies, of course) to give you plenty of practice when learning how to throw down. Fans of Ratchet and Clank are sure to enjoy this co-op brawler, and fans of Wii co-op in general will not be disappointed by the way this one plays.